Already years ago Bart Ebben developed a LHM additive that prevents cold weather Citroen hydro-pneumatic suspension problems. Adding this substance to your LHM hydraulic fluid will improve your suspension performance when temperatures drop below zero. In cold weather the Citroen hydraulic suspension can get problems trying to reach its proper ride height. 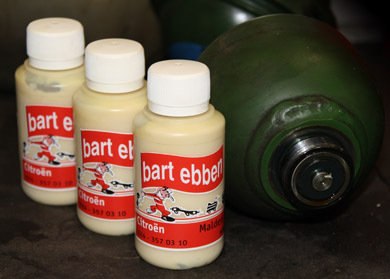 The Bart Ebben LHM additive keeps the fluid flowing better and makes the job of all pumps and spheres easier. Your Citroen will get to driving level faster noticably. For many years we have had very positive results using our LHM additive in Citroen BX, CX, DS, GS, GSA, Xantia and XM models in Scandinavia. Countries like Sweden, Norway and Finland cope with a lot of sub zero cold weather days in winter time. When we provided our Scandinavian customers with Citroen used car parts, they also did a small investment in our hydraulic fluid additive. Our LHM additive has proven to make life easier for Citroën hydro-pneumatic suspension drivers when it's freezing.